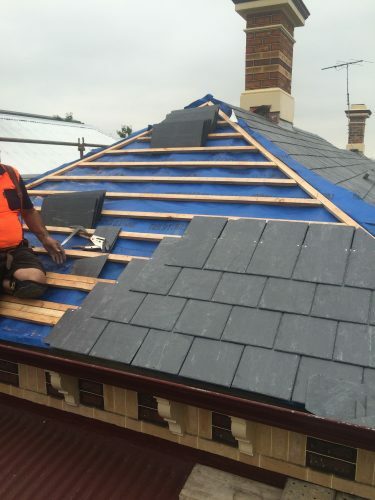 This slate roof project in Moonee Ponds was an interesting one. This single fronted late Victorian era house originally had a bluey-grey Welsh roof slate identified by a few pieces still laying inside on the ceilings. If you have a home that you suspect may have originally had a slate roof but has been re-roofed at some stage, check inside the ceiling cavity. 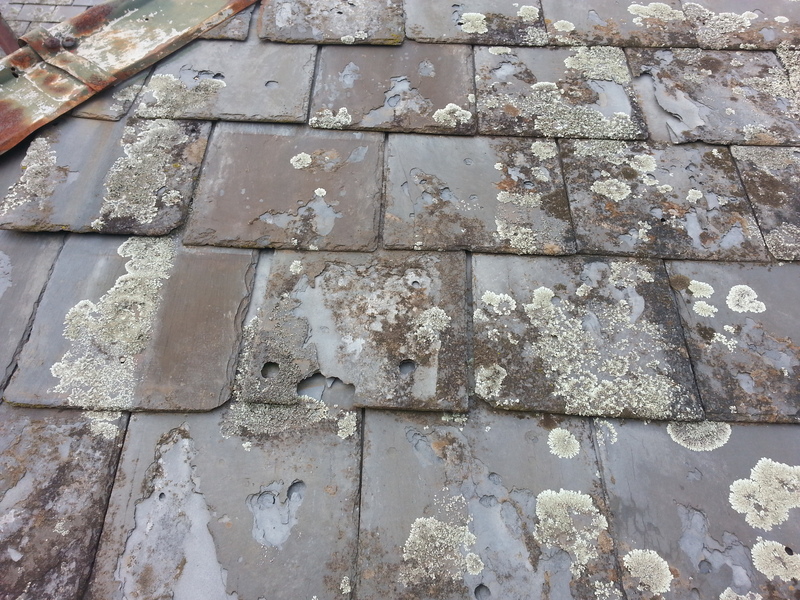 There’s quite often small pieces of slate still present that have fallen through during the re-roofing process. 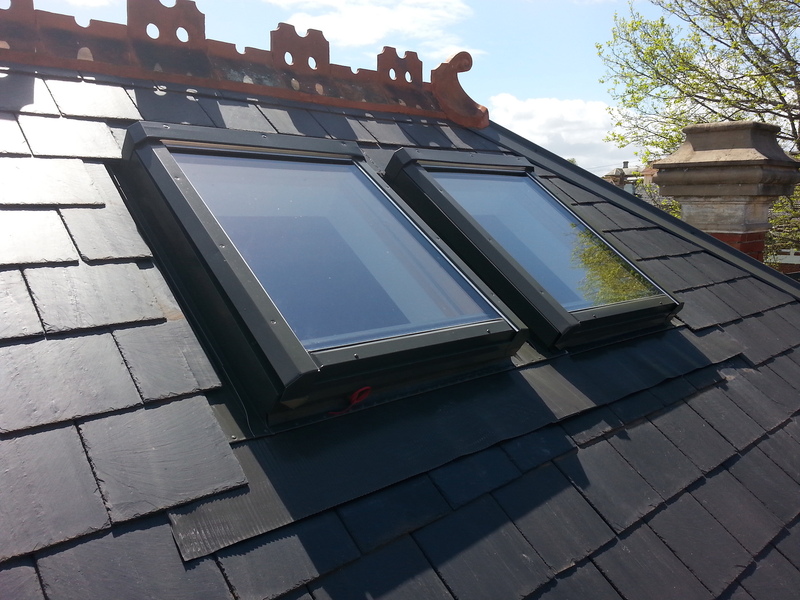 Another tell tale sign is the step flashings around chimneys and abutments… slate roof step flashings are usually much smaller than other roof coverings. One other sign- probably not as common as the others- is small pieces of slate often found while digging around in the garden. Sometimes they’ve even been there for over 100 years from the first installation but they may also have gotten there during re-roofing. The present owner also had a black and white photo of the home taken some time in the 1950’s by a neighbor who was interested in purchasing it at the time. Sometime in the early to mid 80’s the home was re-roofed from the Welsh slate to terracotta tiles. The tiles installed were ” Nubrik mahogany blend” Marseille style tiles and these tiles are notoriously very thick and heavy. Quite a surprise really considering the lighter structured timbers that these Victorian homes were commonly built with. The present owners were very keen to restore the roof, back to the original specs from when it was first built around 130 years ago. 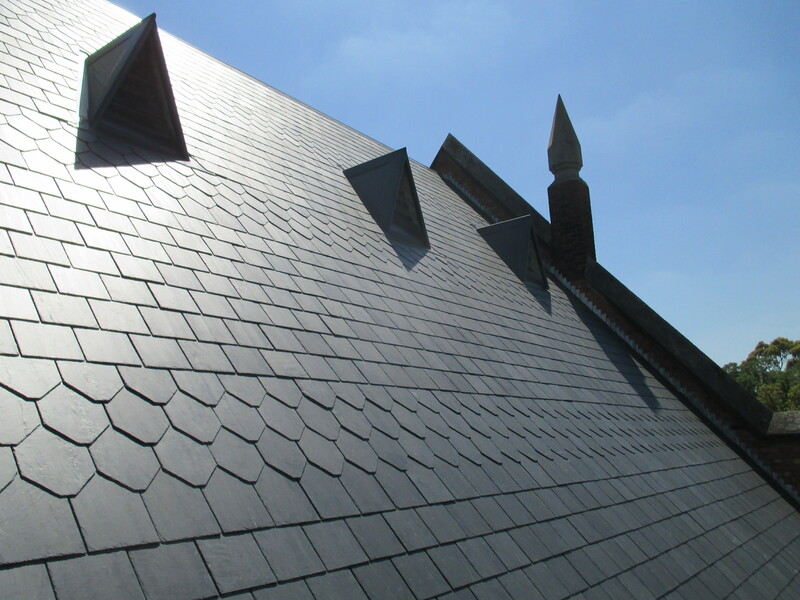 Del Carmen Ultra roof slates were chosen for the job due to their excellent quality and very similar color to the originals. The old photo clearly showed three courses of a flat tailed squint pattern on the front face which we replicated exactly. Always best if doing a complete slate re-roof to use oregon battens to fix the slates to. I’m not a fan of the pine that some slate company’s use as it has a tendency quite often to twist and warp as it dries out under the hot slates. 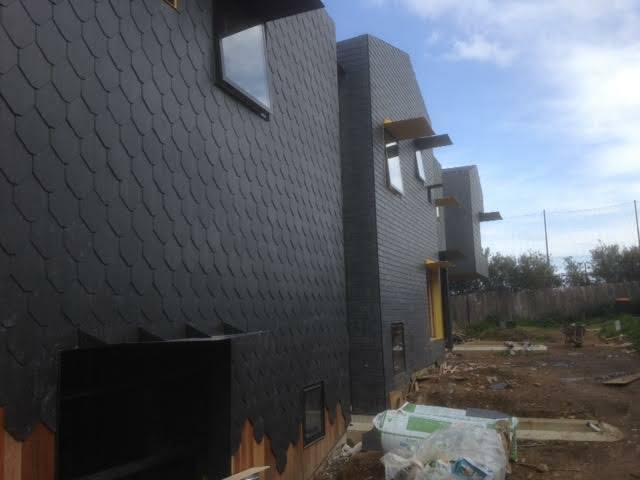 The twisting can cause the slates not to sit snugly down on the course of slate below. It looks ugly but can also leak in the right weather conditions. Insulation sarking on the roof is always a good idea. It’s not 100% necessary but it does give the ceiling good dust protection and offers some insulating properties. For the small additional cost I feel it’s worth it. 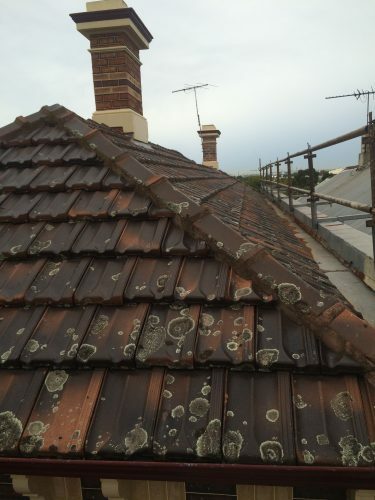 The parapet wall gutters on this roof were changed when it was first re-roofed in the 80’s. Still in excellent condition we gave them a good resealing coating which will last a very long time. Victorian era homes hips and ridges were always finished using metal roll top ridging. Back in the day they were always in a galvanized finish but these days we have a few more options on the finishes. For this job the owners wanted “monument colorbond” ridge caps to minimize any future painting needs. Overall the roof came up very nicely and the homeowners were very pleased with the new look it gave the house. 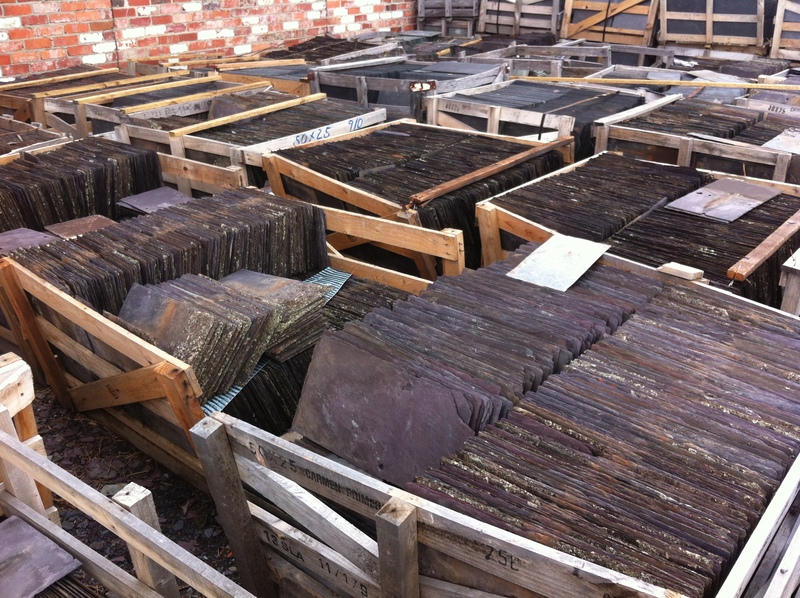 This is how the slate roof would have originally looked when the home was newly built many years ago last century. 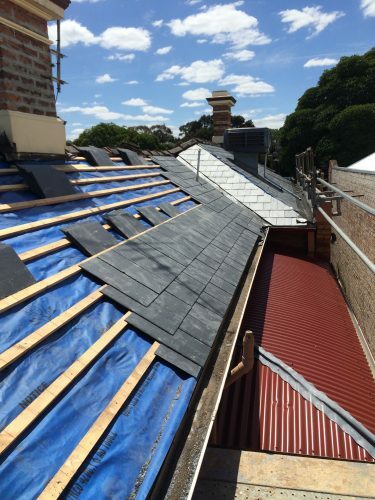 Scroll down for pics of the slate roofing installation in progress.